dated 2 NOV 11 on TVL KE7 ½d (SG.273a) and NTL KE7 1d (SG.148) combination piece. This postmark on just the NTL 1d would be exceptionally rare, but to have the TVL ½d as well is quite extraordinary. 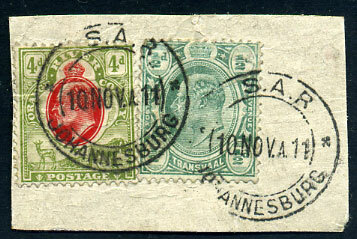 South Africa Railways interprovincial used dated 10 NOV 11 on combination TVL KE7 ½d and ORC KE7 4d piece.